Darjeeling town has been put under video surveillance in its entirety to give the police more eyes to monitor hit and run, robbery and public nuisance cases. Today, the Darjeeling police installed 65 CCTV cameras in strategic locations including in the approach roads to town. The move comes at a time when the hills are set to go to the polls for the municipality election slated tentatively on May 17. The model code of conduct was put into force from Thursday. According to senior police officials, the idea is not to create panic but to have better technology in place for the security of the people. “We don’t want people to think we trying to scare them or invade into their privacy. Our aim is to have a better surveillance system to enhance and tighten security for the public,” said Darjeeling police superintendent Amit Javalgi. The video surveillance in Darjeeling started from today while CCTVs have also been installed in some places of Mirik, Kalimpong and Kurseong and in Kharibari, Naxalbari and Phansidewa in the plains, where the jurisdiction of the Darjeeling police falls. Unlike cities, Darjeeling does not carry the infamous stamp of leading in crimes against women, robberies or hit and run cases, but the police here intend to be ready for all such eventualities. “Installing the CCTVs is a technology intervention in making policing better and efficient. We want to have our eyes all over the town and video surveillance will be of big help to us, as crimes can be checked. It must also be remembered that Darjeeling is a tourist destination,” Javalgi said. The SP said 78 high-end cameras have been put up all over the district for an estimated cost of about Rs40 lakh that has been provided to the police through the transport department. “We have installed high quality cameras with zooming facilities. Some of them will be able to capture visuals at 360 degree angles which is very important. These cameras will be able to record for at least 15 days at a stretch,” the senior police officer said. The monitoring of the CCTVs will be done at the town DSP office (traffic) located in the heart of town. Plans are also on to connect far flung areas through recording machines. “Darjeeling is a vast area and it may not be possible to have CCTVs in every place. But we will set up recording machines in far flung areas and with the help of pen-drives monitor the recordings in town. We are trying to integrate in the monitoring station which will take some time to complete,” the SP said, adding trained personnel would oversee the monitoring along with senior police officials. All approach roads to town from Ghoom and Singamari have also been kept under video surveillance to keep a tab of vehicles entering Darjeeling town. Darjeeling town has been put under video surveillance in its entirety to give the police more eyes to monitor hit and run, robbery and public nuisance cases. 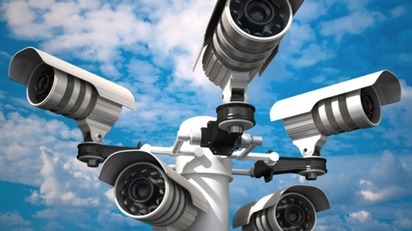 Today, the Darjeeling police installed 65 CCTV cameras in strategic locations including in the approach roads to town.